Our Hanwei Tinker Norman Sword Sharp is made by Paul Chen. 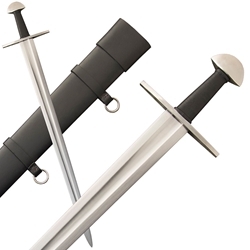 The Tinker Norman sword pair, with their distinctive cruciform guards and brazil-nut pommels, are similar in weight and static balance and offer virtually identical handling characteristics. Both are harmonically balanced, optimizing cutting ability in the case of this sharp version. The blade is forged in 5160 high carbon steel and marquenched to HRc50-52, allowing superior edge retention.The grip is wood-cored and leather-covered over a cord wrap. See models SH2427 for the Tinker Blunt Norman Sword. Made by Hanwei.